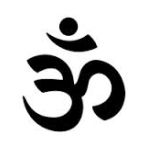 The Ohm (or Aum) sign represents a holy syllable from hindoeistic and boedistic prayers. The symbol represents eternity, infinity and the universe. The symbol is considered to be the origin of all prayers and mantra’s. The most mentioned explanation for the sign is that the ‘3’ represents the god of creation and the ‘O’ represents the silence and the unity of God. There is nothing certain about the origin of this symbol. It probably emerged between the year 3100 en 3200 before Christ.